I’m really not trying to turn this into a cat blog or anything, but this is just too funny. 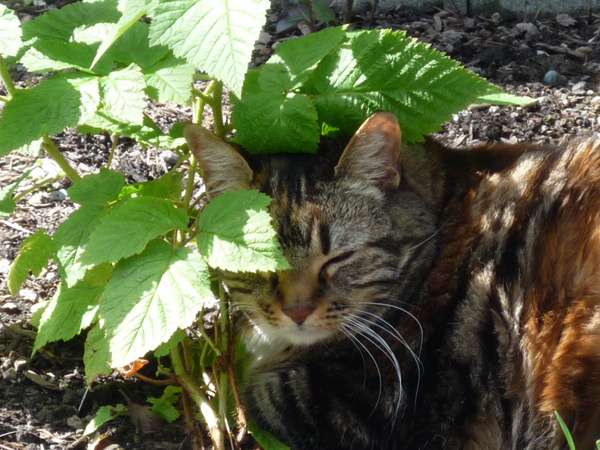 Nikita has made “friends” with our raspberry bushes. Jay thinks maybe it has something to do with their proximity to the catnip and cat grass (i.e. 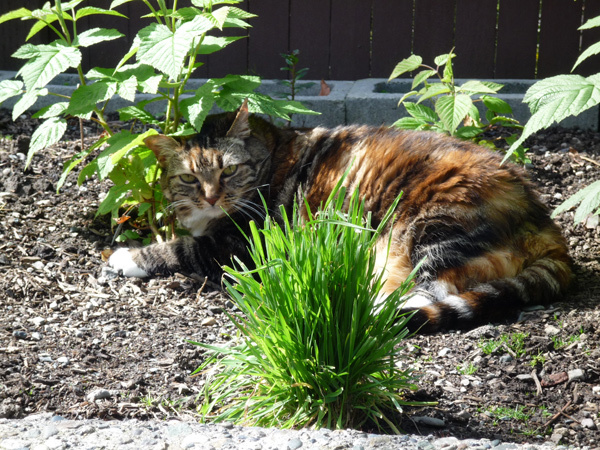 she takes a few chomps of the grass, smells the nip, and the raspberry bushes turn into something more than they really are….) In any case, she really loves them. well, the plants give her shade and the leaves are friendly, smell nice, and don’t bite, scratch, or grab at her… definite buddy material. You sure have a happy kitty. I liked the previous article also. She sure is cute especially because she is 13, most cats get a bit mad after 5-6 years. Don’t worry about making this a cat blog because these two articles bring a smile on everyone’s face.